The City of Dublin does not own or operate wastewater treatment facilities or a water treatment facility instead supplying these basic public services through arrangements with other jurisdictions. The city provides water and sanitary sewer service primarily through contracts with the City of Columbus, as Central Ohio’s regional service provider. These agreements are comprehensive in nature and ensure that the City of Dublin has the ability to provide sewer and water service as the community grows. Limited areas of the city are also provided with sanitary sewer service according to agreements with Delaware County, and Dublin has an additional agreement regarding conveyance of wastewater for the Village of Shawnee Hills. The City of Marysville also provides wastewater and water utilities within portions of Dublin’s planning area. The service area for the City of Dublin and City of Columbus defines specific geographic areas in which service is provided by the respective jurisdictions. Service delineation includes exclusive service areas for both Dublin and Columbus that may be annexed and served by each municipality. An additional Negotiated Service Area defines locations north and west of Dublin where the specific municipality to provide service has not been determined. Agreements stipulate that neither Columbus nor Dublin will annex lands within the Negotiated Service Area without mutual agreement of both representing City Councils. The sanitary sewer service agreement approved on April 13, 1993, provides the City of Dublin the ability to dispose of wastewater through the City of Columbus wastewater collection and treatment system until the contract’s expiration in 2043. The agreement between the City of Dublin and the City of Columbus allows Dublin to construct sanitary sewers necessary to serve developing areas of the city. The operation and maintenance of the sanitary sewer collection system within the City of Dublin is the responsibility of the City of Dublin. Either Dublin or Columbus is required to provide written notification, five years prior to the end of the contract period, to inform the other of its intentions regarding the contract. If written notification by either City does not occur, the contract is automatically extended for a period of three years. The sanitary sewer service agreement effectively provides for reliable wastewater disposal. Dublin’s water service agreement, also entered into on April 13, 1993, provides the City of Dublin access to drinking water until the contract expires in 2043. Similar to wastewater provisions, Dublin is permitted to construct water distribution infrastructure and connect to City of Columbus infrastructure for the purpose of providing or improving water supply to Dublin. The City of Columbus is responsible for routine maintenance and operation of the water distribution system within Dublin. The cost related to excessive maintenance, as defined by a formula within the contract, is the responsibility of the City of Dublin. The maintenance of fire hydrants, water storage facilities and vault structures for pressure reducing valves are also the responsibility of the City of Dublin. Either Dublin or Columbus is required to provide written notification, ten years prior to the end of the contract period, to inform the other of its intentions regarding the contract. If written notification by either City does not occur, the contract is automatically extended for a period of three years. The water service agreement effectively provides the City of Dublin with a reliable source of drinking water. The City of Dublin entered into an Economic Development Agreement (EDA) with the City of Columbus in 2009, including modifications to the existing water and sewer service agreements. The EDA applies to a 277-acre area within the Negotiated Expansion Area, as defined by the 1993 Columbus and Dublin Water and Sewer Service Agreements. 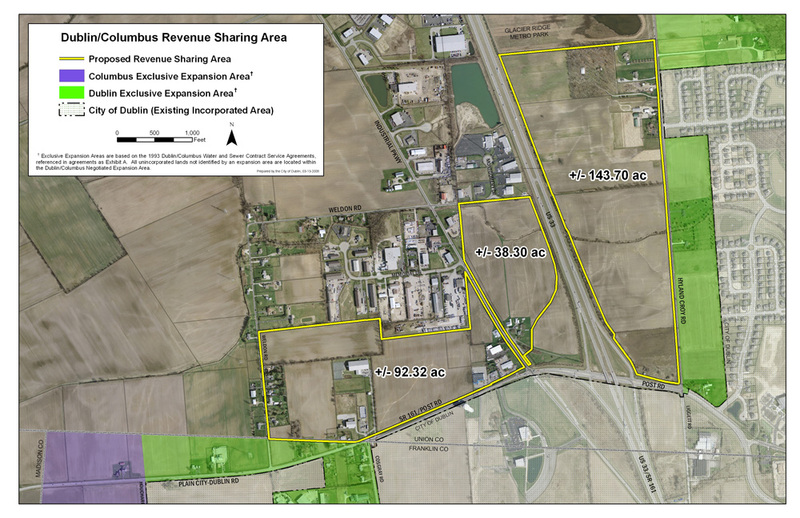 The EDA established the terms and conditions under which the 277-acre area will become part of the Exclusive Dublin Expansion Area. Dublin City Council formally adopted the EDA with Ordinance 43-09 on August 17, 2009. On July 13, 2009, Columbus City Council approved ordinances authorizing the proposed EDA and the associated modification to the existing water and sewer service agreements. Allowing for the annexation of properties adjacent to, and part of, areas planned for substantial economic development investments. Providing the opportunity for greater influence over the development of properties located adjacent to both existing Dublin neighborhoods and a proposed major interchange improvement. Providing for the use of Dublin utility infrastructure, which has been sized and located to serve the area. The initial term of this Agreement terminates on April 13, 2043, unless otherwise terminated prior to that date. On March 18, 2000, the City of Dublin entered into an agreement with the Village of Shawnee Hills located north of Dublin along the Scioto River to provide village access to sanitary sewer service. Today, Dublin provides access to the city’s sewer system in order to transport sewage and other wastes from Shawnee Hills to the City of Columbus system for treatment and disposal. As part of that agreement, the village made a one-time payment for access to transport up to 120,000 gallons per day (gpd). Excess flows will result in additional payments based upon the level of flow. An odor control facility was also provided by the City of Columbus as part of the agreement. The Shawnee Hills agreement will last until 2040, unless written notice is provided by either party at least five years in advance of the termination date. If notification does not occur, the agreement will remain in effect for successive three-year periods. The Shawnee Hills agreement was amended in 2003 to consider sanitary sewer provision to the South Heidelberg Property (Bogey Inn site). As part of the approved contract amendments, the site is served by Shawnee Hills and is subject to Village regulations regarding sanitary sewer services. Flows from this site are not included in the 120,000 gpd contract cap, and the site has been annexed to the city and is subject to Dublin zoning regulations. On August 22, 1994, the City of Dublin entered into an agreement with Delaware County to provide sanitary sewer treatment for portions of land along Summit View Road. For designated areas north of Summit View Road, the city collects wastewater and discharges it to Delaware County for treatment and disposition. The fully developed contracted area includes the Wedgewood Hills, Campden Lakes and Wedgewood Glen subdivisions. These projects were developed in accordance with the agreement at prescribed densities of 1.25 units per acre. Dublin performed inspections on the installation of the sewer system and is required to maintain infrastructure. Capacity fees and use charges are paid to Delaware County. This agreement included service agreements for Shawnee Hills with Delaware County; however, a subsequent 2000 agreement with the Village of Shawnee Hills and Columbus fulfills the requirements to provide the safe transportation of sewer flows as prescribed in the 1994 agreement. Delaware County is responsible to inspect and maintain the sewer collection system in these areas, and capacity fees and use charges in Shawnee Hills are paid to the City of Columbus. 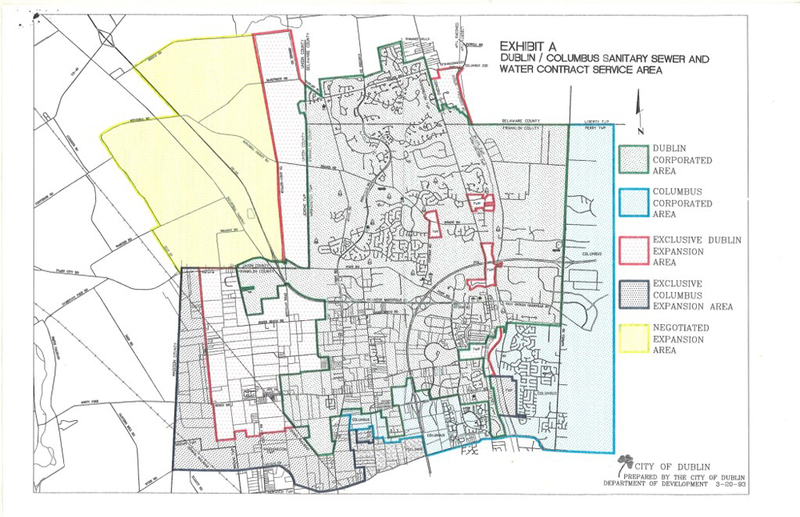 Portions of Dublin’s Negotiated Service Area as defined in the Columbus contracts currently obtain sanitary and water service through the City of Marysville. The area served is primarily located along Industrial Parkway through infrastructure originally installed under the jurisdiction of Union County. The county and City of Marysville entered into a contract on February 1, 2006, that transferred the operation and maintenance of the systems to the City of Marysville with defined areas of future municipal growth and additional areas of exclusive service provision within surrounding townships. 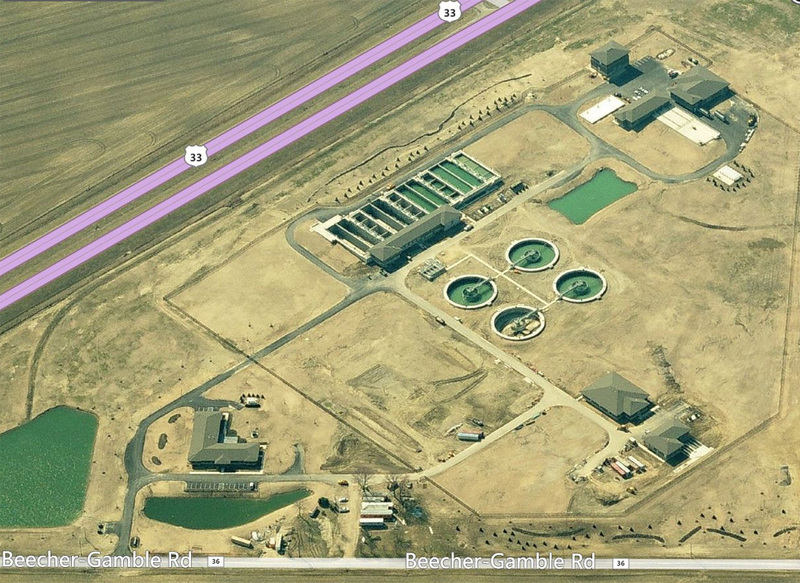 In 2009, the City of Marysville completed the construction of a new wastewater treatment facility north of U.S. 42 adjacent to U.S. 33 on Beecher-Gamble Road.. The plant addresses capacity and environmental issues with the existing facility and will manage the treatment of up to eight million gallons per day (MGD). While the City of Marysville is obligated to maintain service to existing county customers, coordination of services outside Marysville’s expected growth area and aging infrastructure provides opportunity for regional dialogue and cooperation as development progresses in the Negotiated Service Area. In November of 2008, City Council approved Resolution 83-08, which authorized the City Manager to enter into an agreement with the Ohio Environmental Protection Agency (OEPA) regarding the Director’s Final Finding and Orders (DFFO) related to sanitary sewer system discharge and storm water inflow and infiltration. The OEPA issued the final version of the DFFO on February 11, 2009. The DFFO requires that the communities that discharge their wastewater into the Columbus system plan and implement practices to assist in minimizing illegal discharges from the Columbus system. All of the requirements listed above have been met. The SSES is an on-going project and is on an approved 15-year schedule. As a governmental agency, the City of Dublin strives to provide its residents and businesses with the safe and efficient collection of wastewater and adequate distribution of potable water for consumption and fire protection. As Dublin continues to grow and further development occurs in the U.S. 33 Corridor Area and Northwest/Glacier Ridge Area ), the presence of overlapping service areas provides an opportunity for coordinated water and sanitary sewer provision that can result in greater efficiency and benefit to the entire region. All potential options for water and sewer provision should be considered as growing development affects the capacities and operational function of the planning area; policies relating to these growth issues should be examined with future development. While the City has traditionally provided water and sewer service to areas only within municipal boundaries, the consideration for extending services outside the city should also be evaluated as a means to achieve economic development goals and other quality of life objectives. Existing or future service agreements should be considered within the context of long-term maintenance and infrastructure viability for all remaining portions within the service area.